Laurentia extends as far west as eastern B.C. (Figure 21.3), but the ancient rocks of the craton are almost completely covered by younger rocks in B.C., Yukon, and all of Alberta except the far northeast corner. Laurentia is well represented in northern Saskatchewan and across large parts of Manitoba, the Northwest Territories, and Nunavut (Figure 21.5). Where they are exposed, the rocks of the Canadian Shield are highly varied lithologically, typically strongly metamorphosed due to their deep burial at some time in the past, and in some cases, quite different from what could be expected to occur on Earth today. Starting from the south, in eastern Manitoba and adjacent Ontario, we have the ancient rocks of the Superior Province. On the map the Superior Province, rocks are mostly pink, representing granitic and gneissic rocks, with strips and blotches of green, representing metamorphosed sea-floor basalt and sediments, also known as greenstone belts. These rocks are widely interpreted to have deep crustal origins, and include large areas of granulite facies metamorphic rock formed at high temperatures and moderate to high pressures (see Figure 7.19). Superior Province greenstone belts in Ontario and Quebec host some of the world’s largest volcanogenic massive sulphide deposits. As described in Chapter 20, the Superior Province in northern Manitoba is host to important nickel deposits at Thompson. These formed from mantle-derived mafic magma that interacted with sulphur-bearing crustal rocks, and within which heavy-metal sulphide minerals formed. The Trans-Hudson Orogen (THO), as its name implies, extends through Saskatchewan and Manitoba and over to the eastern side of Hudson Bay. It represents the continent-continent collision zone between the Superior Craton to the south and the Churchill Craton (including the Wyoming, Hearne, and Rae Cratons) to the north; thus it’s a remnant of the initial formation of Laurentia at around 1.9 Ga. At the time of the collision, the THO would have been a major mountain range, and the rocks that we see there now — which evolved deep beneath those mountains — are highly metamorphosed sedimentary and volcanic rocks intruded by large granitic bodies. The important volcanogenic massive sulphide deposits around Flin Flon are within the THO. The Churchill Craton is lithologically similar to the Superior Craton, although not generally as old. It includes two important sedimentary basins: the Athabasca Basin in Saskatchewan and the Thelon Basin in Nunavut, both filled with rocks aged around 1.7 Ga. These consist primarily of sandstones and minor mudstones that are only weakly metamorphosed and essentially undeformed (not folded) because they are situated within a stable craton and so have not been subjected to significant tectonic forces. The Athabasca Basin is economically important for its large and rich unconformity-type uranium deposits (see Chapter 20). At its western end, there is the remnant of a large extraterrestrial impact, the 40 km diameter Carswell Crater. When the meteor struck at this location, at around 115 Ma, the impact and subsequent rebound of the crust was enough to bring metamorphic rock up to surface from beneath about 2,000 m of Athabasca Group sandstone. There is no connection between the Carswell Crater and the much older (~1.2 Ga) uranium deposits. 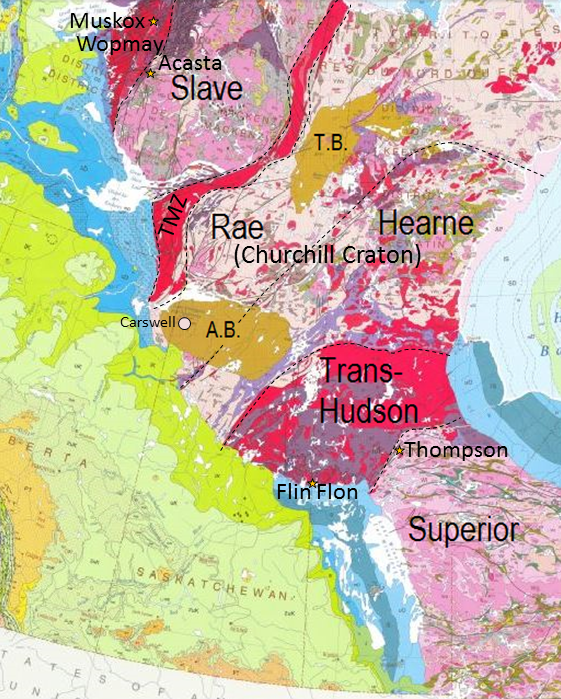 The Taltson Magmatic Zone (TMZ), which forms the boundary between the Churchill and Slave Cratons, consists primarily of granitic rock. One interpretation is that the TMZ formed along a convergent boundary, although this is not universally accepted. The Slave Craton is dominated by granitic rocks and metamorphosed clastic sedimentary rocks. 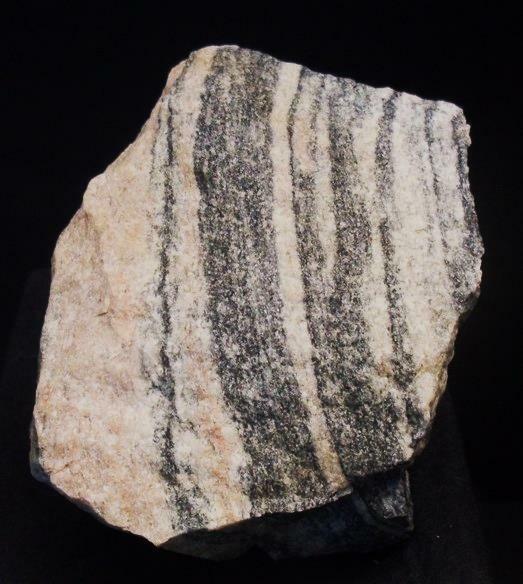 On its western edge, there is a large area of very old gneissic rock that includes the Acasta Gneiss, dated at 4.03 Ga, which, for the time being at least, is the oldest rock in the world (Figure 21.6). The Wopmay Orogen, interpreted as the site of another ancient continent-continent collision, lies to the west of the Slave Craton. Although mostly composed of felsic igneous rocks and gneisses, the Wopmay Orogen includes a body of mafic and ultramafic igneous rock called the Muskox Intrusion. Derived from a mantle plume and dated at about 1.1 Ga, the Muskox is comparable to a handful of other mafic and ultramafic intrusions around the world in that it has distinctive repetitive layering caused by settling of heavy metal-rich minerals within the low-viscosity magma. Muskox has high levels of nickel, copper, and chromium, and has the potential to have platinum and palladium like a similar body in South Africa. Ultramafic intrusions like Muskox do not take place on Earth today because the mantle is no longer hot enough. 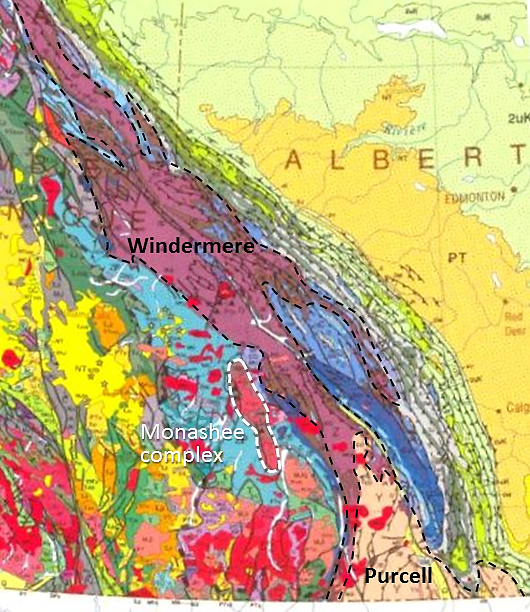 The oldest rocks in British Columbia are the strongly metamorphosed sedimentary, volcanic, and intrusive rocks of the Monashee Complex, situated to the west of the Columbia River near Revelstoke (Figure 21.7). Aged around 2 Ga, these may actually be part of Laurentia. There are much more extensive Precambrian rocks within the Columbia and Rocky Mountains of southeastern B.C. and the southwestern corner of Alberta. The rocks of the Purcell Supergroup (a supergroup comprises more than one group) are present in the extreme southeastern corner of B.C. and adjacent Alberta, and extend well into the United States (as the Belt Supergroup). These are mostly unmetamorphosed clastic rocks deposited in rivers and lakes during the middle Proterozoic, at around 1,400 Ma, while Laurentia was still part of the supercontinent Columbia. When Columbia rifted apart, the division happened within the area of the Purcell/Belt rocks. Similar rocks of the same age are present in Tasmania and Siberia, and it is postulated that they were once part of the same depositional basin. Exercise 21.2 Purcell Rocks Down Under? 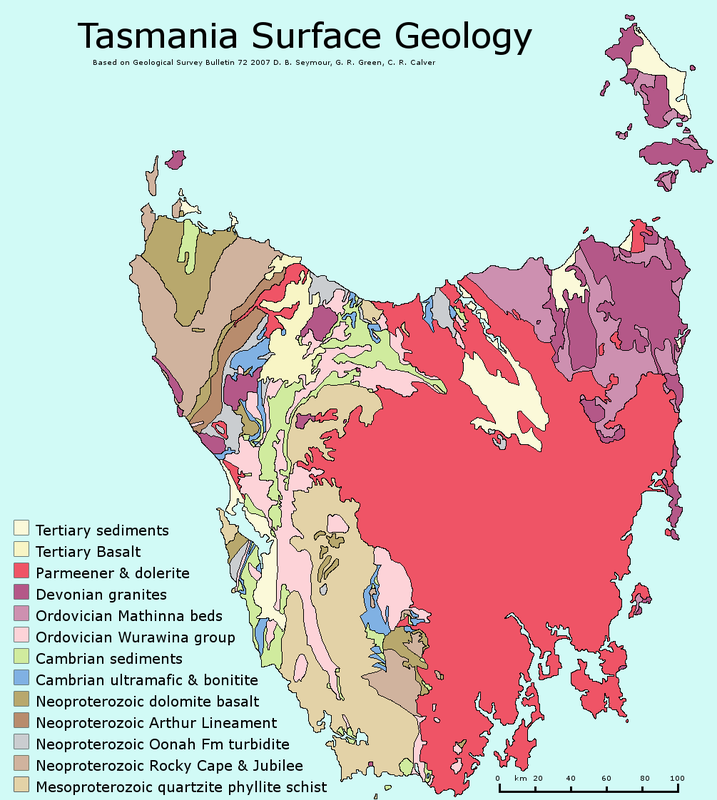 This map shows the geology of the Australian state of Tasmania. 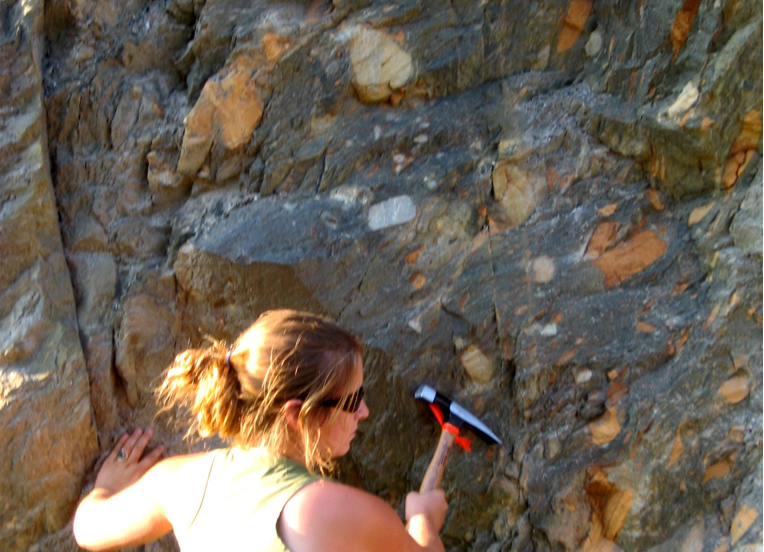 Identify which rocks might be comparable to the Purcell rocks of B.C. and Alberta. In what way are these rocks different from those in Canada? The Windermere Group rocks — also mostly clastic sedimentary — were deposited in the ocean along the western edge of Laurentia (Figure 21.7) in the late Proterozoic (around 700 Ma) after the breakup of Columbia. In fact, sedimentary rocks of this age extend all along the western side of the Rocky Mountains, well into Yukon. Deposition in this area was taking place during the late Proterozoic Snowball Earth glaciations, as can be seen in Windermere Group rocks of the Toby Formation from the area south of Cranbrook, B.C. (Figure 21.8). The Toby Formation is a fine-grained marine rock (mudstone) with numerous large angular clasts of limestone and quartz. The mud was deposited in the quiet water of a continental slope environment, and the large clasts were dropped from floating ice derived from glaciers on Laurentia. The Toby Formation is unique in this area; most of the rest of the late Proterozoic clastic sedimentary rocks in this region do not have glacial dropstones. 21.2 Western Canada during the Precambrian by Steven Earle is licensed under a Creative Commons Attribution 4.0 International License, except where otherwise noted.